Originally a sculptor, Pudlo Pudlat devoted himself to drawing, painting and printmaking due to an arm injury that made carving difficult. Pudlat’s subject matter combines a connection to a traditional culture and a fascination with the new technologies changing his community. In contrast with most of his contemporaries, Pudlat depicted in his art the new objects he encountered in the Canadian North and through his travels including images of air travel, powerboats and even new architecture. During his lifetime, Pudlat produced over 4500 drawings, 180 prints and several sculptures. His works are in the collections of most Canadian museums and have been exhibited internationally. 1990 Attended the opening of “Pudlo: Thirty Years of Drawing”, the first solo show for an Inuit artist at the National Gallery of Canada. 1989 Travelled to Mannheim, West Germany to attend the opening of his one-man exhibition at the Inuit Galerie. 1988 Attended the gala opening of the new National Gallery of Canada in Ottawa. 1986 Norgraphics Limited. Pudlo was one of several artissts whose work was acquired and released by Norgraphics Limited between 1976 and 1984. The works that were selected are documented in the Cape Dorset Graphic annual catalogue of 1986. 1986 Marion Scott Limited. Pudlo’s ‘Flight to Sea’ lithograph was printed in 1985 and featured during the Vancouver Exposition in 1986. 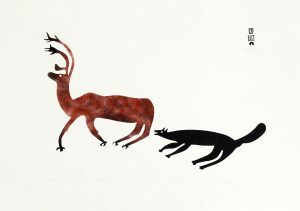 This work is documented	in the Cape Dorset Graphic annual catalogue of 1986. 1979 Queen Elizabeth Hotel Commission. 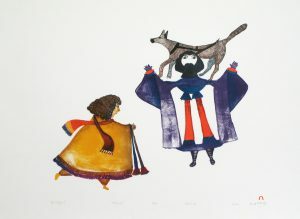 Honouring ‘Great Montrealers’ Pudlo produced a lithograph entitled ‘Shores of the Settlement’, also included in the Cape Dorset Graphic annual catalogue of 1979. ARTS OF THE ESKIMO: PRINTS: /Ed. by Ernst Roch. Texts by Patrick Furneaux and Leo Rosshandler. Montreal: Signum Press in association with Oxford University Press, Toronto, 1974. PUDLO HANGINGS FOR INDIAN AND NORTHERN AFFAIRS LOBBY. About Arts and Crafts, Winter, 1978. pp.2-3. Blakeman, Evelyn NO HUNTING, JUST ART FOR PUDLO. Edmonton Journal, October 31,1978. Blodgett, Jean IN CAPE DORSET WE DO IT THIS WAY: THREE DECADES OF INUIT PRINTMAKING: Jean Blodgett/with essays by Heather Ardies, Leslie Boyd and Linda Sutherland. Kleinburg, Ont. : McMichael Canadian Art Collection, 1991. 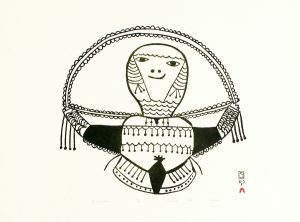 ARCTIC IMAGERY: Contemporary Inuit drawings from a private New Jersey collection. Montclair, N.J.: Montclair Art Museum, 1992. CEAC [Canadian Eskimo Arts Council] TRANSCRIPT OF THE INTERVIEW WITH PUDLO PUDLAT, WITH NAOKO MATSUBARA: Interviewed by Sharon van Raalte in May 1985 in Cape Dorset, N.W.T. Ottawa: Canadian Eskimo Arts Council in collaboration with the Inuit Art Section, INAC and the National Film Board of Canada, 1985. Canadian Guild of Crafts Quebec CANADIAN GUILD OF CRAFTS QUEBEC. = GUILDE CANADIENNE DES METIERS D’ART QUEBEC: The Permanent Collection: Inuit Arts and Crafts, c. 1900-1980. Montreal: Canadian Guild of Crafts Quebec, 1980. Gautsche, Nancy MYTH, MURDER AND MADNESS: Violence in Inuit Art. Inuit Art Quarterly, vol. 4, no. 3, Summer, 1989, pp.14-18. 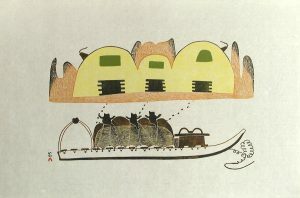 Gustavison, Susan J. ARCTIC EXPRESSIONS: INUIT ART AND THE CANADIAN ESKIMO ARTS COUNCIL 1961 – 1989. Kleinburg, Ont. : McMichael Canadian Art Collection, 1994. Halifax, Joan SHAMAN: THE WOUNDED HEALER. London, England : Thames and Hudson, 1982. 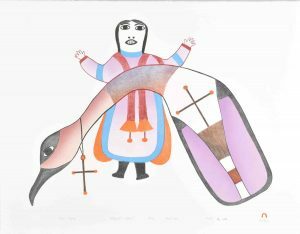 Hassler, Gitta KUNST AUS DER ARKTIS: GRAPHIKEN DER INUIT IN KANADA. Zurich: Volkerkundmuseum der Universitat Zurich, 1994. Muehlen, Maria PUDLO PUDLAT: IN The Canadian Encyclopedia, James H. Marsh, editor-in-chief. Edmonton: Hurtig Publishers, 3:1511, 1985. 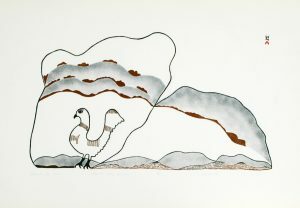 Muscarelle Museum of Art (Williamsburg) CONTEMPORARY INUIT DRAWINGS: The gift collection of Frederick and Lucy S. Herman. Williamsburg, Va.: The College of William and Mary in Virginia, 1993. Ryan, Terrence PUDLO PUDLAT’S FORCEFUL LEGACY: Who will follow the master? Arctic Circle: Spring, 1993, pp. 32-33. Winnipeg Art Gallery CAPE DORSET. Winnipeg: The Winnipeg Art Gallery, 1979.